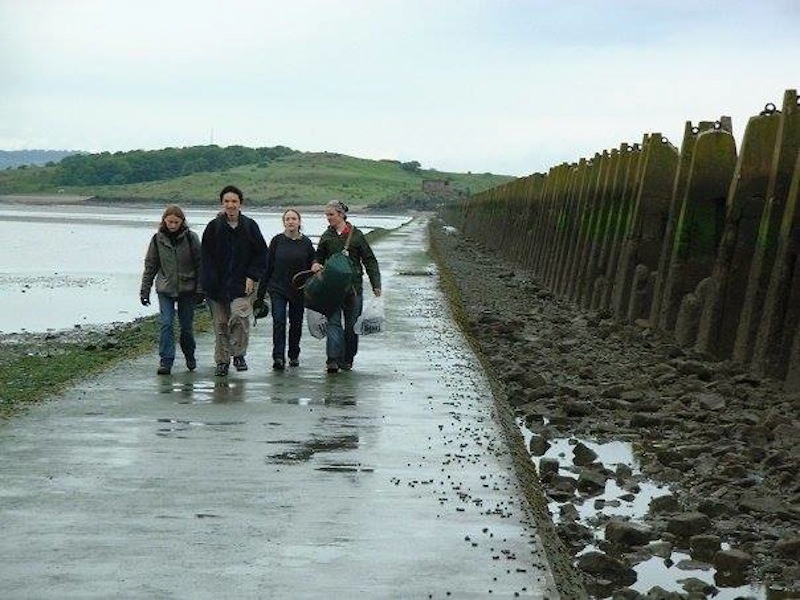 The picture was taken during a trip to Cramond Island. It was my first year studying in Scotland. A few friends, who I’d met in the halls of residence, organised an outing one weekend. They decided that this island, which was just one bus ride away from the city centre (where we lived), was a good destination for fun and games. So we bought some water guns, and I tagged along with them for a water gun fight. The manmade tombolo connecting the island to the mainland disappeared during high tide. So we thought it would be a bit of an adventure to walk to the island at low tide, stay on the island when the tombolo disappeared, and then go back when it resurfaced. No one lived on Cramond Island, and the only manmade things were some abandoned watch posts and barracks, which were constructed during the Second World War. It was a gloomy day (otherwise known as a normal day in Scotland) when we visited. We had lunch in one of the barracks, and then my friends ran around frantically on the small island shooting water at each other. I didn’t join in the games, because it was too much of a shock for me. Before setting foot on Cramond, I was a pampered child living in a metropolis. I could not imagine myself having lunch under the roof of a deserted structure on an uninhabited island. There were no seats, no table, and no electricity. We sat on the dirty floor, possibly next to dozens of wild creatures, and ate our sandwiches. My friends, who were all Britons, thought nothing of it. But the trip was definitely something I had never experienced. I still remember, while my friends were aiming their water guns at one another, I leaned against the window of the watch post, and contemplated the North Sea. The weather was windy, cold, and wet; the place was dusty, dirty, and uncomfortable. But the experience was strangely pleasant. Inside this expired fortification, looking out at the greyish ocean, and hearing the laughter and screams of my friends, a sense of peace emerged somewhere inside my mind. I wasn’t thinking what to have for dinner later; I wasn’t worried about the essay I had to write; and I wasn’t missing anyone anywhere in the world. I was away from everything I was familiar with; I was living in the moment; I was myself. This fond memory reminds me of a song “Wild Child” by Enya. The photo above was taken on the way back from Cramond Island. I came out of it a wild child.